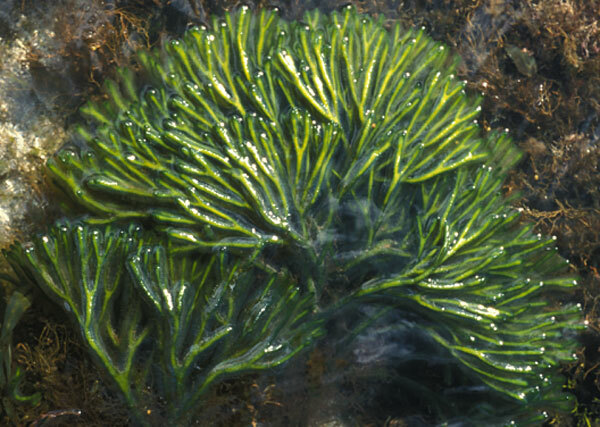 Description: A spongy, dichotomously branched green alga without distinct flattening at the forks of the branches. A number of subspecies have been described, some of which have been introduced in various parts of the world. Although two spubspecies were widely accepted as having been introduced into Britain and Ireland, recent detailed genetic studies have shown that this is not the case. Habitat: Mainly in pools in the upper and mid-shore; relatively uncommon in Ireland and Britain. Distribution:NE Atlantic: Netherlands (Stegenga et al., 1997). Britain (Burrows, 1991). Ireland (Guiry, 1978; Burrows, 1991). N. France (Feldmann & Magne, 1964). N. Spain (Pérez-Cirera et al., 1989). Azores (Neto, 1994). Mediterranean: Spain (Ballesteros, 1981; Ballesteros & Romero, 1982; Gallardo et al., 1985). Adriatic shore of Italy (Furnari et al., 1999). Adriatic (Battelli & Vukovic, 1995; Battelli, 1996). Greece (Gerloff & Geissler, 1974). Australasia: New Zealand (Adams, 1994, adventive). Site © M.D. Guiry 2000 - 2019. Important copyright notice: all text, design and photographs on this site are copyrighted by M.D. Guiry unless otherwise stated and all rights are strictly reserved. Click here for copyright information and contact. Website design: 249 Design Studio. Site maintained by M.D. Guiry (michael.guiry@nuigalway.ie). There have been 8736853 page loads since 1 January 2014 on 25 April 2019.